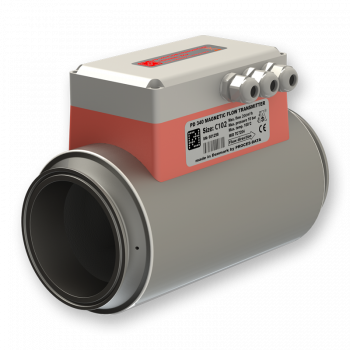 The Meterhead consists of a stainless metering pipe with clamp liners. Two magnet coils are mounted external to the metering pipe. Inside the metering pipe two stainless electrodes are mounted. 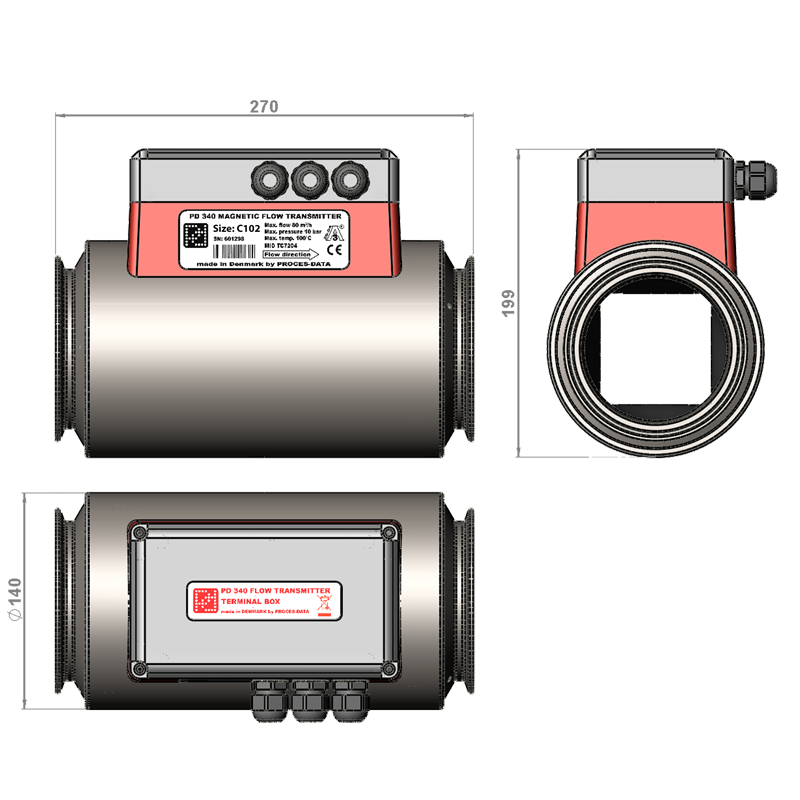 The measuring section is designed so that changes in flow profile do not affect meter accuracy. 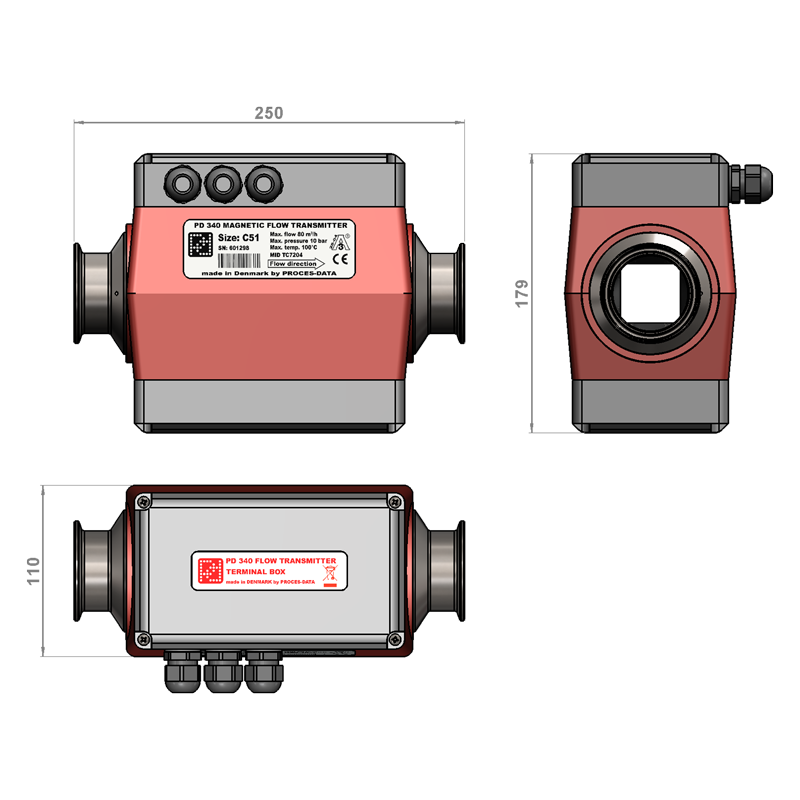 Hence the transmitter has a wide range of flow rates within its linear accuracy. Changes from laminar to turbulent flow do not affect the linear accuracy and changing viscocity has no effect on meter accuracy. The calibration of the rneterhead is carried out using a computer controlled calibration facility. The Electronics Module, which controls both the sequence of measurement and output signal transmission, is available in either standard version or extended version. The standard version has two pulse output signals and one logic input. The transmitter can also be directly connected to a display unit. The extended version can be configured for two pulse outputs, exactly as with the standard version. Alternatively, one of the pulse output signals can be changed into an analog current output signal, 4-20 mA, or the separate pulse outputs can be transformed to a combined 3-phased output signal. See the manual for further details. On the extended version electronics it is possible to connect the transmitter to a P-NET Fieldbus (data communication network) for central data collection or control. PD381 Terminal Box, which provides terminals for connecting power supply, digital and analogue I/O-signals, as well as the P-NET Fieldbus communication cable, and a PD210 Display Unit. The PD381 Terminal Box is equipped with 3 cable glands. PD385 Terminal Box with Profibus DP interface, which is the alternative when Profibus DP fieldbus communication is preferred, rather than traditional pulse or analogue signals. The PD385 provides terminals for connecting power supply, Profibus DP communication cables, and a PD210 Display Unit. In the event that the device is the last node on the Profibus cable, the built-in termination circuitry can be enabled by means of dedicated terminals. The PD385 Terminal Box is equipped with 4 cable glands. The largest PD340 meter, the C102 (4″) is constructed differently. 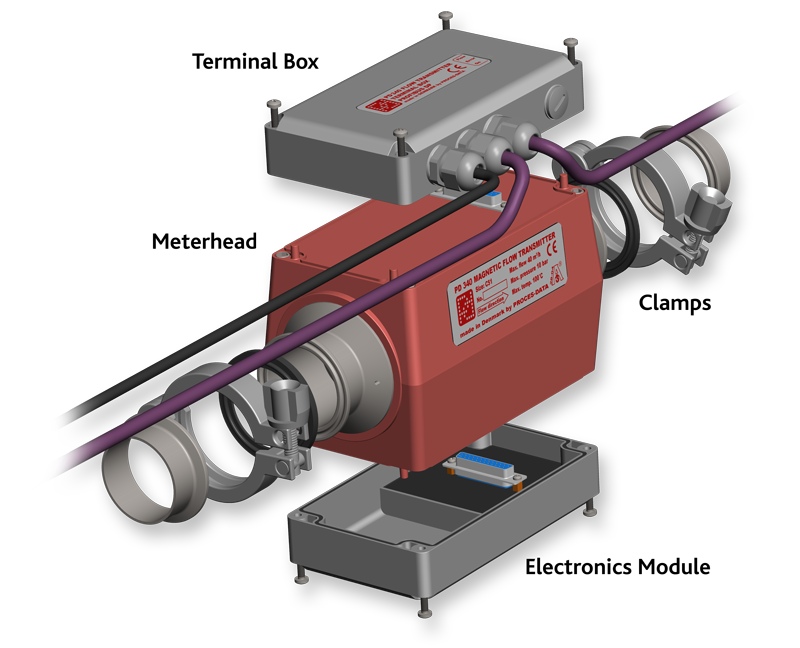 The meterhead and the electronics make up one integrated unit. Apart from that, the C102 is in principal the same construction as the smaller meter dimensions, and the terminal box is also the same.